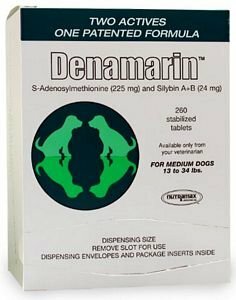 Denamarin is a nutritional supplement for dogs and cats that supports liver health and function. 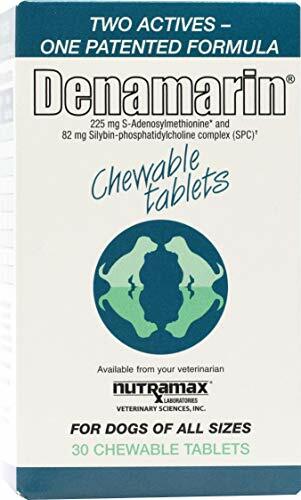 Denamarin comes in tasty chewable tablets and contains two active ingredients: S-Adenosylmethionine (SAMe) and silybin which help maintain oxidative balance and protect liver cells from cell death. 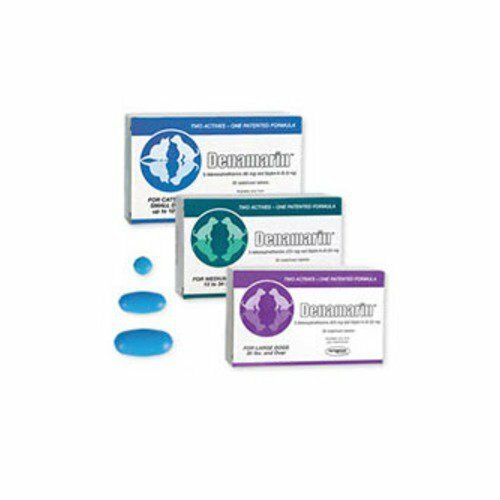 Help your pet keep a healthy and well functioning liver with Nutramax Denamarin Supplemental Tablets for Dogs and Cats. This nutritional supplement for cats and dogs contains S-Adenosylmethionine (SAMe) and silybin and is made to help protect liver cells, and support the organ with silybin. 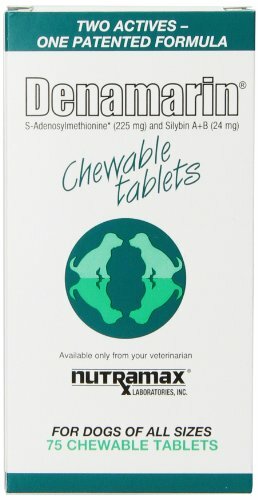 Chewable and easy to administer, Nutramax Denamarin Supplemental Tablets for Dogs and Cats is recommended by veterianrians and has no know serious side effects. 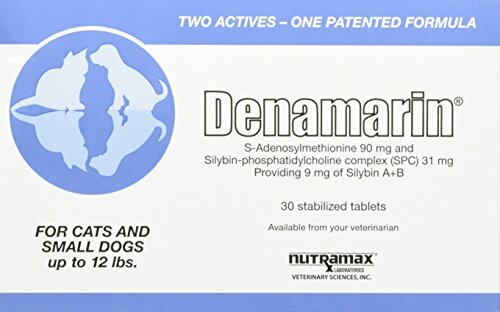 Denamarin is a liver supplement for cats and dogs, containing S-Adenosylmethionine (SAMe) and silybin, SAMe has been shown to markedly increase liver levels of glutathione, an important compound for liver health. 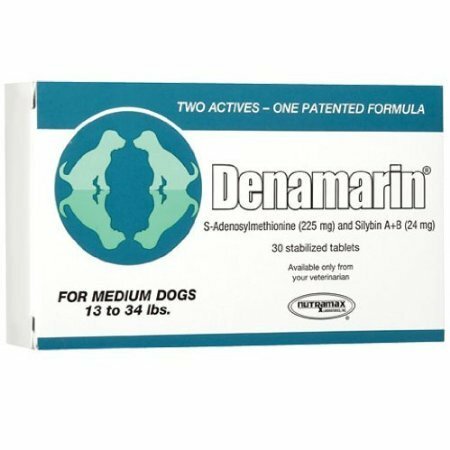 The SAMe in Denamarin has also been shown to help protect liver cells from cell death and may help cell repair and regeneration. 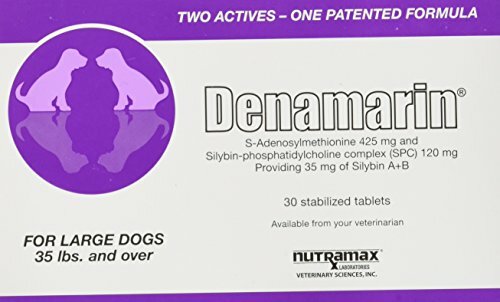 Denamarin also helps support your pet's liver through the administration of silybin, extracted from milk thistle, which has been shown to support liver function by helping maintain a healthy oxidative balance. Denamarin also has a place in supporting brain health by elevating cerebrospinal fluid levels of SAMe. Suggested daily dosage: Suggested daily dosage: up to 12#: 1 enteric-coated tab per day. The dosage can be gradually reduced or increased at any time, depending on the pet's needs. Many pets are maintained long-term on every-other-day or every-third-day administration. Supports healthy levels of glutathione, a powerful antioxidant, and the liver's first line of defense. Use in dogs and cats to help support and maintain healthy liver function. Ideal for aging pets and for providing additional liver support to pets taking NSAIDs for arthritis management. Storage: Store in a cool, dry place. Keep tablets in original blister pack until used. Tablets are sensitive to moisture and extreme heat and should not be split or crumbled. Marin Plus Liver Health Supplement support liver health in dogs of all breeds, these tasty soft chews are loaded with key ingredients known for their hepatoprotective properties?including silybin, vitamin E and curcumin?plus MCT oil, zinc and green tea extract for more goodness in every bite. Silybin is a more potent form of silymarin?a natural compound from milk thistle that provides liver support?and comes in a phosphatidylcholine complex for better bioavailability, which means more of it gets absorbed. Plus, since it?s in the form of a tasty soft chew, it?s easy to give just as you would a treat! Provides liver support with silybin, vitamin E and curcumin in a tasty, easy-to-give soft chew. Silybin is a more potent form of silymarin from milk thistle, which can be more effective and have higher bioavailability. Helps support digestion, normal bile production and healthy nutrient absorption, and is recommended for use along with Denosyl or Denamarin to help maintain liver health. With added zinc, green tea extract and MCT?medium chain triglycerides?oil for more nutrition per bite. Convenient administration in a tasty soft chew and is great for dogs of all breeds and sizes; comes in a resealable package for optimum freshness. 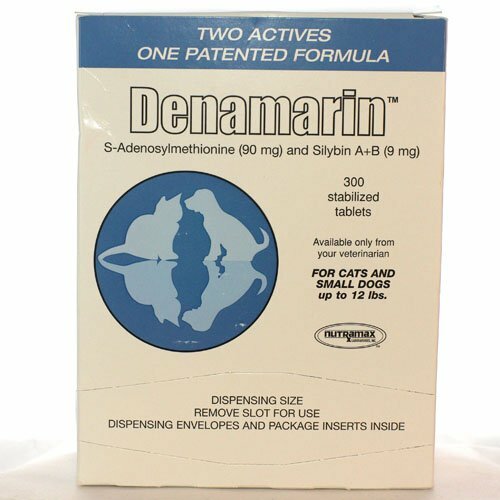 Denamarin combines a pure and stabilized S-Adenosylmethionine with Silybin to provide a multi-faceted approach to liver support, as well brain health.